D’Appolonia’s dam and waterway experience includes more than 200 projects related to earth and concrete-gravity dams utilized for water supply, hydroelectric power generation, cooling and drinking water supply, pumped storage, flood control, river navigation, irrigation, recreation, and tailings and sludge disposal. 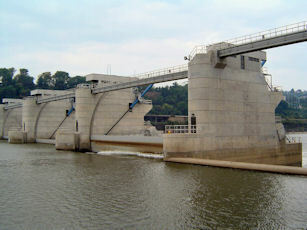 Our dam engineering work includes successfully completed projects in the United States and overseas. In the U.S. we have worked for private industry and federal, state and local governments on dam projects ranging from performing safety inspections to embankment and hydraulic structure design and related construction monitoring. We have designed earth embankment dams and related hydraulic structures, and we have provided services for rehabilitation of existing dams. Our primary areas of technical expertise and project experience related to dams and waterways are summarized below. More detailed discussions of individual topics can be accessed by clicking on the links provided. D’Appolonia’s dam experience ranges from the design of new earth embankment dams to the rehabilitation of existing earth and concrete-gravity dams. This work has included design and rehabilitation of primary and emergency spillways and related hydraulic structures. Typical dam rehabilitation projects have included repair of downstream slope failures, redesign of spillways to increase capacity, raising of dam crests to increase storage and discharge capacity, repair of damage to spillways from undercutting and spalling, repair of structural elements associated with spillway gates, armoring of dam faces to allow for additional storage capacity under extreme flows, and design of shore and channel protection systems. Our capabilities also include performing detailed geological studies, geophysical exploration and seismic analyses of dams including liquefaction potential evaluation. Inspections are an important component of most D’Appolonia projects related to dams. In addition to performing inspections for state and local agencies, D’Appolonia performs inspections of privately-owned dams licensed by the Federal Energy Regulatory Commission (FERC). This work has included Part 12D dam inspections, failure modes analyses, and acting as a facilitator between the dam owner/operator and the FERC. Many of our senior staff have performed dam inspections, and two staff members are qualified by the FERC to perform Part 12D dam inspections. Our engineers are experts in recognizing conditions such as seepage areas, incipient slide areas, non-functional spillway structures or components, and other conditions that might pose a threat to the stability of a dam or to residents living downstream. We perform annual dam safety inspections for many of our clients and submit the reports to appropriate state agencies for review. Monitoring of structure performance through design, installation and observation of instrumentation systems is an important part of D'Appolonia projects related to geotechnical engineering. We have extensive experience with respect to instrumentation systems for dams and related hydraulic structures such as spillways and locks. Our experience also includes monitoring of slope movements, monitoring of short- and long-term settlements associated with fill placement, monitoring of equipment foundation vibrations, and monitoring of ground water levels through installation of various types of piezometers. We have designed automated recording systems for instrumentation that can be remotely observed and systems that trigger alarms when certain conditions are met. We are familiar with state-of-the-practice monitoring equipment and related electronics. D’Appolonia performs flood routing studies associated with the development of sites adjacent to streams and rivers or with the actual design of water conveying channels. Typically this work involves determination of the applicable design basis flow, which may be determined through analysis of meteorological or historical flow records. Software programs such as HEC-1 or HEC-RAS are generally used to determine profiles of flow elevation in the area of interest. For dams, these analyses are used to determine the design-basis discharge, which governs the required spillway capacity. We are also experienced in determining the effects of a hypothetical dam breach and routing the resulting flow through the natural channel downstream from the dam. The analysis of flow in open channels and large conduits is a frequent component of our projects associated with dams and with development/redevelopment of industrial sites located adjacent to rivers. 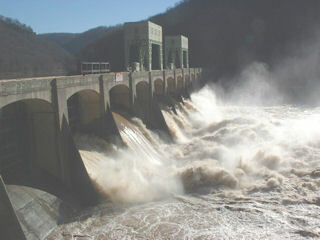 D’Appolonia has prepared emergency action plans (EAPs) for more than 30 dams in Pennsylvania and other states in the U.S. These structures have included small debris collection impoundments located in urban areas, flood retention structures designed by the U.S. Soil Conservation Service (now Natural Resources Conservation Service - NRCS), water supply dams, and large run-of-the-river dams. The scope of work for these projects typically includes determination of the Probable Maximum Flood (PMF) for the dam, simulation of a dam breach occurring simultaneous with the PMF and under normal (sunny day) conditions, and determination of the maximum inundation area resulting from the dam breach analyses. Once the inundation area is determined, road closure points are identified and assigned to police and fire departments based upon location/jurisdiction. The EAPs typically provide contact lists and acknowledgement of concurrence by the participating emergency service providers.